A rare sponge crab has gone on display at Blue Planet Aquarium, Cheshire Oaks after being donated by a fisherman. The bizarre-looking crustacean was originally hauled up in the pots of lobster fisherman Richard Workman three miles off the coast of Barmouth, Gwynedd and is now making itself at home in one of the aquarium’s native marine displays. The crabs get their name from the fact they hold living sponges – which they also cut to fit – on top of their shells as a way of camouflaging themselves from would-be predators. 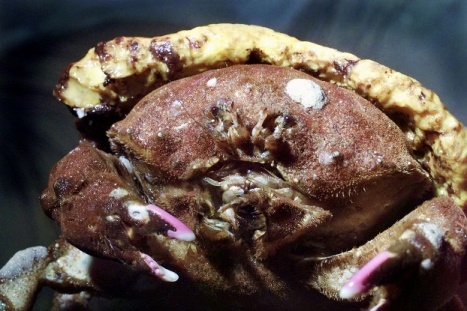 Sponge crabs are more commonly seen off the West coast of Africa or in the Mediterranean but in recent years their numbers have been increasing in British waters and they may be permanent residents around our coasts. Blue Planet Aquarium’s Stacy Adams said “We’re very grateful to the fisherman for donating it to us. They really are amazing creatures and this one is a particular fine specimen, measuring around 10cms long. “Sponge crabs have two pairs of modified legs tipped with needle-like pincers which they use to secure sponges which sit on their backs. They are quite adept at moving sponges over the whole of their body to enable them to hide. “However, this means that they only have two pairs of legs to walk on so they tend to also use their front claws to assist them with walking. “Their bodies, claws and legs are completely covered in a thick furry ‘felt’ except for the tips of their claws which are a vivid ‘rose pink’!” she added. In warmer waters the crabs have been found using the rubber soles of flip flops in place of living sponges.